We paddled Lake Potanipo in Brookline this afternoon under a cloudy mist. It's only about twenty minutes from our house. Given the fact that we were short on time and the weather was "iffy" at best, we decided to stay close to home. Our philosophy? A little time on the water is better than NO time on the water. We had never paddled Potanipo before, but we knew the lake had shoreline development and motor boat traffic. When we were there today, there were two or three water skiers and tubers. So Lake Potanipo isn't the secluded nature haven we prefer, but it was okay for a short paddle. It's easy to get to and has an easy concrete ramp put-in. By my count, there are about 20-25 houses on this 136-acre lake, which feels more like a pond. Development is limited to one side of the lake, so evergreens still dominate the far shore; Unfortunately, that's where the power boaters were during our visit, so we couldn't paddle near the undeveloped side. There's a small, members-only beach near the put-in and Camp Tevya (a Jewish summer camp) on the northern shore. Overall, Lake Potanipo was a pleasant enough waterway to paddle for a short time on a cool, drizzly day. But we're guessing that when the weather is nice, this place must be clogged with way too many power boats and sail boats from the camp to make it enjoyable for kayakers and canoeists. Directions: Take Route 101W (toward Keene/Peterborough) to Rte. 13 South toward Brookline. After several miles, turn right at the blinking light onto Mason Road. The put-in is almost immediately on your right and is well-marked. Alternate Directions: From Everett Turnpike in Nashua, take exit 6 to Rte. 130 West until you come to Brookline Center (maybe 8-10 miles?). In front of Daniels Academy in Brookline Center, stay straight on Meetinghouse Hill Road. At red blinking light, continue straight across Route 13 to Mason Road. Boat launch for Lake Potanipo is the second right, just before going over the bridge. There are Bears in Those Hills! So here's the final installment in our three-part series on Franconia Notch. I want to share our experience paddling Echo Lake, not to be confused with the lake of the same name in North Conway. Echo Lake in Franconia sits right off Route 93, at the base of Cannon Mountain, so you can expect quite a bit of road noise. With Cannon Mountain's ski trails and aerial tramway nearby and a small beach at one end, this isn't a secluded paddle. There were also a few people out in small fishing boats the day we were there. 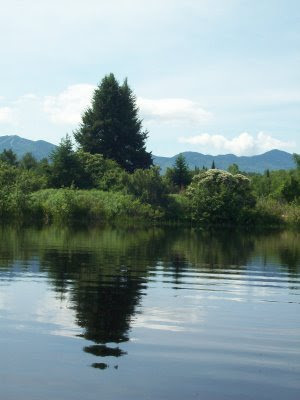 The lake is only about 28 acres, according to the NH Fish and Game. The plusses are some great views of Mount Lafayette, and of course, Cannon Mountain. The main attraction the day we were there was a black bear roaming around near the top of the ski slope. We could watch from the lake with our binoculars, so that was cool! One of the fishermen from the area told us it was common to find a bear rummaging around the back of his pickup truck. Apparently bear sightings are common any time of day. With Echo Lake being so small, we only paddled for about an hour; In fact, a good portion of the time we weren't paddling at all, we were sitting and watching the bear. I wouldn't consider Echo Lake a destination by itself, but rather an appetizer on the smorgasbord that is Franconia Notch State Park. There's lots to do here, including hiking, biking, camping, and swimming. Visit Franconia Notch State Park for more details. Interested in seeing some photos of lupine, wildlife and scenic NH vistas? Check out this slideshow from last year's Lupine Festival photo contest. You'll need to scroll down the page a bit and click on the slideshows. Since my flower photos are underwhelming, I'll try to post some links later to sites with nice lupine photos. For now, here's a slideshow of some of the places we saw and things we did while in Sugar Hill and surrounding towns. Be sure to scroll all the way down under the slideshow to "Read More" about the Franconia area. The word "festival" is relative. 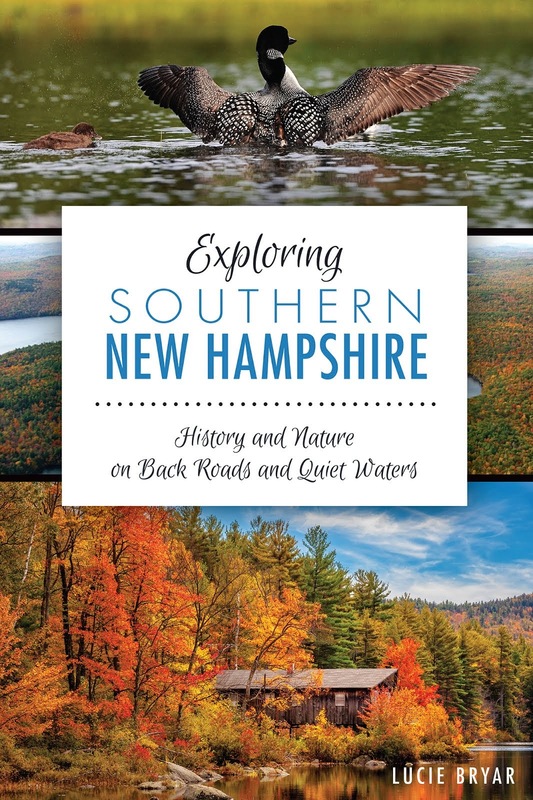 There's not a whole lot going on in these small New Hampshire towns, even during the festival. Unless you're happy to spend hours gazing at fields of flowers, I recommend you plan your own adventures. 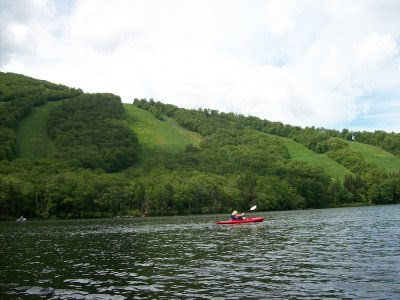 With so many natural attractions in the area, it's not hard to do! 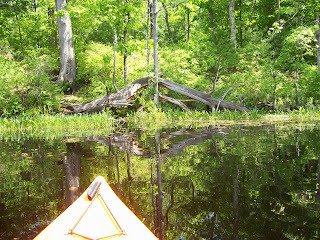 I already wrote about kayaking Streeter Pond. We also paddled on Echo Lake at the base of Cannon Mountain, which I'll post about in more detail soon. Profile Lake is in the area, too. 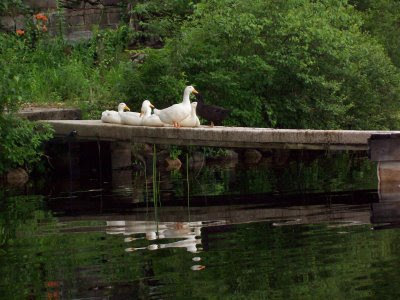 For a list of potential kayak and canoe sites, check out http://www.franconianotch.org/. An 80-passenger car brings you to the 4,080-foot summit of Cannon Mountain in under ten minutes. On a clear day, you can see the mountains of four states (New Hampshire, Maine, Vermont, New York) and Canada. Once you get to the top, you can walk a short scenic path to a 360-degree observation deck. We didn't have a clear view of all four states and Canada, but there was plenty to see. Our state really is beautiful! Neither one of us had ever visited Littleton before and we were both pleasantly surprised. It's a small town with a decent-sized Main Street, filled with shops and restaurants. We didn't take advantage of it, but there's a self-guided walking tour of historic sites. This was a festival-related event held at the Meeting House. Hotdogs, chili, chicken -- all the usual fare and live bluegrass music, too. We bought a jar of homemade Danish ginger pickles that were reminiscent of the ones Doug's grandmother used to make. The woman who sold them to us invited us to call her when we make them on our own so she can "walk us through." Gotta love it! We stayed at the Sunset Hill Inn. I'll be honest here and say the Inn itself isn't all that impressive, mostly because there's a lot of deferred maintainence (peeling paint, stained carpets, dripping faucets -- you get the picture). But for me, the wonderful location cancelled out all of that. Sunset Hill has great mountain views, both from the well-landscaped grounds and from the formal dining room. So those are highlights from our short weekend, but there are so many more outdoor hiking and walking trails, waterfalls, zip lines, you name it. If you've visited the Franconia area, why don't you write and let us know your favorites? 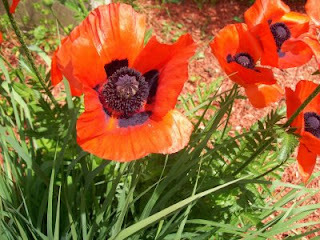 We spent last weekend in Sugar Hill, NH for the lupine festival -- it was very low-key but fun! I've decided to post three short write-ups, starting with this one about Streeter Pond. Can you say "beautiful reflections?" That's my lasting impression of this small pond. Not sure if Streeter Pond is in Franconia or Sugar Hill, but it was only about four miles from where we stayed at Sunset Hill in Sugar Hill, just off Route 116. One source says the pond is about 65 acres. We arrived mid-morning and spent a little over an hour paddling around. So it's not the type of place that will occupy your day, but in my view, it's well worth it if you're in the area. And there are lots of reasons to visit Franconia Notch -- more on that in a later post. While there's only one house on the pond, you can hear some road noise from nearby route 116. But for me, the mountain views and reflections cancel out the road noise. I don't think my photos do it justice. We saw lots of birds, including red-winged blackbirds, orioles, and gold finches. And while Streeter is small, it still invites exploration. There are little islands and bends to explore. I'm working on a short slideshow of the natural beauty we found near Franconia, but I'm techno-challenged. For now, I say load your canoe or kayak on to your vehicle, and head to Sugar Hill! Directions (from http://www.franconianotch.org/): It's easy to find once you're in the area. Take a left off route 116, heading north on Streeter Pond Road. Boat launch is a left after you pass the pond. The put-in is not as gradual as many we've been to, but it's do-able. Any Suggestions for Paddling in Franconia Notch? We're headed to Sugar Hill, NH in Franconia Notch this weekend for the Lupine Festival and other outdoor activities. I'm looking at maps and checking the internet for paddling sites. Right now we're looking at Streeter Pond, Profile Lake and Echo Lake as possibilities. Anyone had experience with any of these or have any other suggestions for flat water paddling in the area? Please send us a comment! Kayaking was on our agenda yesterday. Since we were a little short on time and the weather started out overcast and cool, we stayed close to home and went back to the Nashua River where Doug had seen so much wildlife last weekend. Once again, the wildlife was out in full force (and this time it was mid-morning). We also had two heart-pounding mini-adventures... more on those in a minute. To begin with, the put-in near Stellos Stadium is wide and smooth (no rocks). Shortly after leaving the launch area, we spotted the resident family of Mute Swans -- a Mama, Papa, and two babies or cygnets about 800 feet from us. As beautiful as these birds are, they can be aggressive toward animals and humans, particularly when there's a nest or babies involved. So we were trying to give them a wide berth by paddling over to the far side of the river, but apparently it wasn't wide enough. There was no doubt that Papa swan was striking an offensive pose. I learned later it's called busking -- his neck curved back and his wings half raised, he was coming at me pretty fast; they can reach up to 55 miles an hour. So I did the only thing I could think of: I paddled back toward the launch as fast as I could! Luckily, he backed off and didn't attack, but my heart was racing from that encounter. 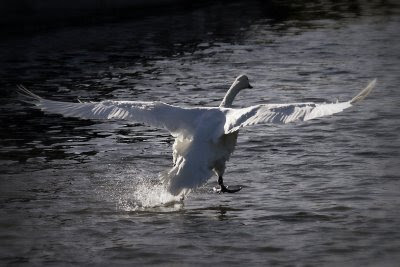 Note About Mute Swans: They are fiercely territorial. While we were well aware that we shouldn't crowd them, I learned afterwards that they guard very large territories of anywhere from 4 to 10 acres. It's hard to keep that distance on a narrow river or small pond. Eventually, the swan family retreated to the left bank of the river and we set out again, staying well to the right. Next we came upon an osprey nest. At the same time, various birds were darting around the river, including a Red-Winged Blackbird and what we think was a Northern Oriole. We also saw a great blue heron, a beaver, muskrat, and lots of Eastern Painted turtles, prevalent in this part of the state. Naturally, his kayak started to fill with water and we didn't have a pump. (More on being prepared in a moment.) He succeeded in dragging the very heavy, water-filled kayak up aforementioned steep muddy embankment and emptied all the water out. Trouble now was that there really wasn't an easy way to re-launch. He tried again, only to end up in the water a second time! Luckily, his third attempt was the charm. The whole experience also got us thinking about what would happen if one of us dumped out in the middle of the river. Hmmm...we probably need to practice re-entering our boats. Other than that, we had a great time on the Nashua River yesterday and would highly recommend it. If you go, just beware of the Mute Swans and stay away from steep embankments! Can we talk about our experience on our first group paddle last weekend? We both thought it was fun! To begin with, neither one of us was really sure if we would like being out on the water with a group, since we've been paddling by ourselves for three-plus years now. Unless you count the few times we've been on a guided trip, like Kayaking with the Manatees in Florida or when we've taken family along -- we usually plan our own trips and go at our own pace. 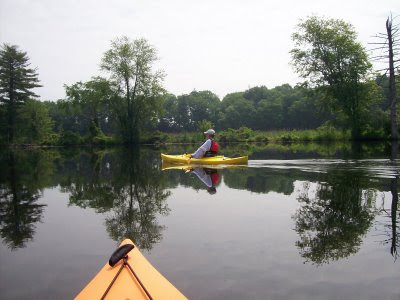 After all, part of the joy of paddling for us is the peace and solitude. But surprisingly, we did find it fun to meet others with the same passion and talk about their mini-adventures on the water. 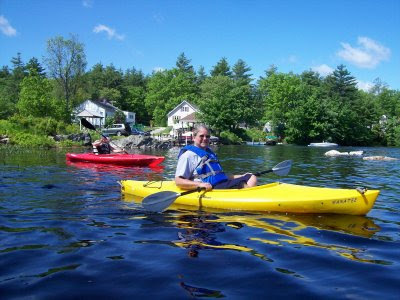 I signed us up for the East Hampstead (NH) Kayaking Meet Up Group last year, but we didn't get to take part in an activity until recently. I love the whole concept of the Meet Up website. Their motto is something like, "Use the internet to get off the internet." In other words, meet people online with similar interests and then step away from the computer and go out and enjoy! 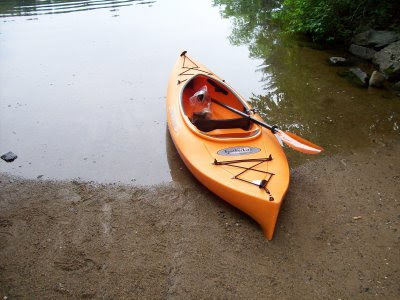 We met five other people (of mixed ages and paddling interests) at Dubes Pond in Hooksett and before too long, we had exchanged introductions and launched our boats. I was concerned about pacing, since I didn't want to have to keep paddling to keep up. Sometimes, I just like to sit and ponder the beauty around me. No problem there. I guess most people who are into quiet water kayaking feel the same way. If you rush to get somewhere, how will you enjoy what's there? Bottom line? It was a good experience and we're looking forward to more trips with the group. In just two years, it's grown to include 440 members. Seems like there's always someone looking to get out on the water and if you don't see a trip that interests you, you can arrange one of your own. Check it out at East Hampstead Kayaking Meet Up. As a side note, the subject of tandem kayaking came up as part of our conversation at Dubes Pond. Naturally, I had to relay the shortened version of our own experience in Florida in February. If you're contemplating buying or trying a tandem kayak, I invite you to read How We Lost Our Groove in Florida. Turns out another long-time married couple in our group had done it successfully, so there is hope. Just not for us! After the thunderstorms rolled by on Sunday and the sun came back out, I found myself wondering why I was still inside watching TV. Even though it was later in the afternoon, I decided that I wanted to be on the water. I hastily got my things together (less the camera --that turned out to be a mistake) and headed for the Nashua River. Lucie and I have been talking about trying the river for some time and at less than 5 miles from the house, I was on the water by 5:00 p.m. The boat launch allows you to access the river from Stellos Stadium and paddle all the way to Runnells Bridge in Hollis. Using my keen navigational skills, I decided to go to the left from the put-in and paddle upstream. (This was not a hard choice seeing that if I went right I would go over a dam onto the rocks below). It only took about 10 minutes before I saw the first wildlife of the day, a great white swan. A little further upstream I spotted an osprey nest with two little heads peeking over the edge; Mom was nowhere in sight but Im sure she was in the area. Shortly beyond this point I was startled when a large blue heron burst from the reeds next to my boat. I was within 15 feet of the bird and never saw it! After getting my heart rate back to normal, I proceeded up the river for about an hour before turning around. In the short 90-minute paddle I encountered three swans, a heron, an osprey, ducks, geese, a muskrat and a beaver. I don't think I've ever seen this much wildlife in one short trip. It just goes to show that sometimes what you are looking for is right under your nose and you don't even know it. When I got home, I looked at a map of the river and determined that I only went about 1/3 to 1/2 the way up to Runnells Bridge. There were other boats on the river but the ones I encountered were all fishing boats that were slowly trolling along with electric motors. The only time they used their large motors was to get back to the boat ramp. I'm looking forward to going back to the river and this time I'll take my camera. Oh, and Lucie too, of course! Things to Know Before You Go: Watch for fallen tree stumps in the river. Directions: From the north, take the Everett Turnpike to exit 5-W in Nashua to route 111. Go over the highway and turn right at the second set of lights onto Riverside Drive. Take your first left and head straight toward Stellos Stadium. When you see the Public Works garage, bear right to a dirt road and the put-in.